You are about to request a quote for Targeted DNA methylation service.Fill out the form below and we will be in touch with you very soon. Targeted DNA methylation analysis allows for the quantitative study of cytosine methylation at known and precise locations throughout the genome. Depending on the size of the region of interest, a number of methodologies can be employed including bisulfite pyrosequencing, bisulfite amplicon sequencing (BSAS), and custom capturing with probes. 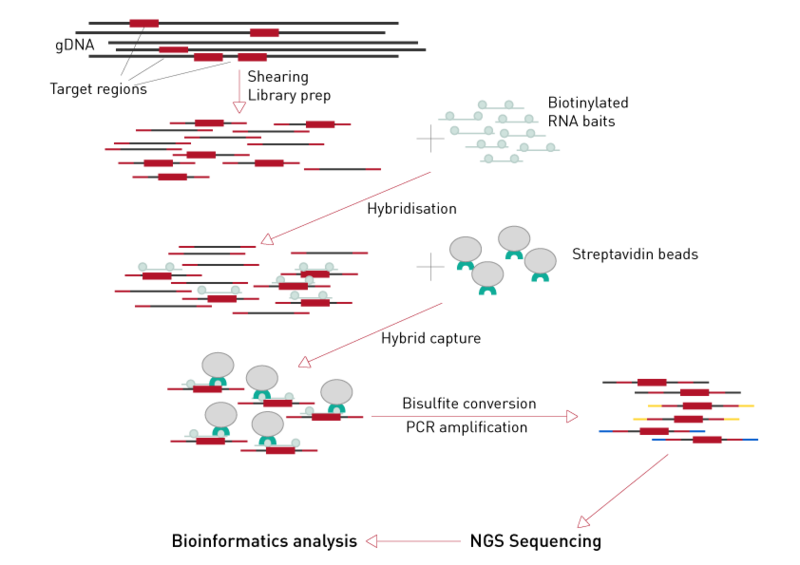 These techniques share a common methodology of bisulfite conversion followed by sequencing in order to quantitatively detect the methylation status of the target regions at single nucleotide resolution. Bisulfite-converted DNA and target region(s) amplified with several PCR amplicons. Amplicons sequenced using Illumina® platform. Target region(s) selectively captured with custom-designed RNA baits (Agilent SureSelect). Captured regions are bisulfite-converted and sequenced on Illumina® platform. Differential methylation analysis for any service is available upon request. Diagenode strongly recommends using this:	Targeted DNA methylation service (Diagenode Cat# G02070000). Click here to copy to clipboard.